This race report comes a bit late. On October 18, I had the privilege of racing for TeamUSA in the ITU Duathlon World Championship in Adelaide, Australia. As this was a race in the southern hemisphere, October was early summer for Australia but the end of my race season. This posed a few unusual race challenges. Here’s how it went down. One of the big problems with a late-in-the-season race for an older athlete is an increased risk of injury. Doing basic strength work is easy in the wintertime when outdoor workouts sound particularly unappealing. When the skies brighten and rainy days give way to endless sunshine, the prospect of indoor strength workouts loses its appeal. In retrospect, over the course of the summer, I noticed that my hamstrings and hip flexors had been feeling just a little bit tighter than usual. Tight, but certainly nothing out of the ordinary. At least it seemed that way until about two months ago. I had done the workout a week before with good results. This time round, everything started well, but halfway through my initial 10-K run, the skies suddenly darkened, the air turned noticeably colder, and I was stuck in a heavy rain. About a mile away from the end, my right knee started hurting but I foolishly kept increasing my pace. By the time I reached home (where I would transition to the bike), my knee was in trouble. I managed the bike ride without any issues, but had to abort the final run. Over the next few days, my knee continued to feel wonky. I was convinced it was a case of patellar tendinitis– a soreness along the tough sinew that connects the kneecap to the lower leg. But over the course of a few days, the pain shifted and was now in a new place– right next to the bony lump towards the inside (medial side) of my knee. I happened to have a long-standing appointment with my sports medicine doctor already scheduled and, when I went to see her, she told me that I had a case of pes anserine tendinitis. As it would turn out, this injury (which I’ve never had before) would put a major crimp in my training plans. I had to take two weeks off– and then reduce my running to three days a week thereafter. I had to stop running speed work up to two weeks before the race. Oddly, my cycling workouts were fine but I didn’t use my extra slack in training to get in any additional bike workouts. It seemed like a lot of my friends were also injured– and we all agreed that this wouldn’t be a record-setting year for any of us. Next came the flight to Adelaide. So why a picture of Incheon Airport (Seoul, Korea)? Well, my friend Mary and I first flew through Seoul. It was hardly a direct flight– Seattle to San Francisco (2 hours), then San Francisco to Seoul (12 hours), and then Seoul to Brisbane (10 hours). Would I do it again? Absolutely! Australia is just incredible! As this was my first trip, I didn’t know what to expect. I didn’t expect to see flocks of cockatoos in Adelaide. I didn’t expect to see ibises and iguanas in Brisbane. But this post isn’t about my trip to Australia– it’s about my race. 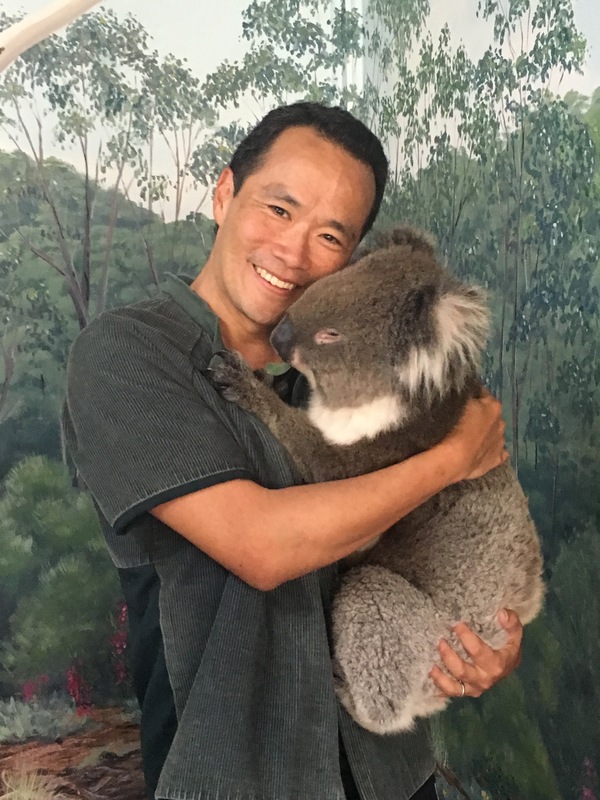 Well, it’s about hugging koalas and also about my race (my koala friend Garu was at the Cleland Wildlife Park on the top of Mount Lofty near Adelaide– definitely worth the trip if you’re visiting Adelaide). For the week before the race, I stayed with my friend Mark Dawson and wife Jane. I met Mark back in 2013 when we were both in Switzerland for Powerman Zofingen. While I never got to race because of a serious calf strain three days before the race, I did get to meet Mark who became a good friend. Since then, Mark joined our team for our winter training camp in Maui and our climb up Mount Haleakala. The week before the race went great. I was sleeping and eating well– thanks to Mark and Jane’s great hospitality. After racking our bikes the night before, race day morning was stressful but generally went according to plan. To get to the race start, Mark and I rode commuter bikes about two miles to the race start– quite a perfect warmup. I also had my pre-race nutrition pretty dialed in and it went without a hitch. Then came the last minute tweaks to my transition setup– inflating my tires (they lose pressure because of the latex tubes), setting up my cycling shoes on my bike, etc. Lining up, I felt pretty good. As soon as the gun went off, I felt fine. I was breathing fine. My legs felt great and my knee was holding strong. Only problem was that I wasn’t moving very fast. I was putting in exactly the same effort as I did at Nationals– I was just running over a minute per mile slower. As I was running, I started thinking about my other buddies who were injured or who had their training compromised leading up to this race. Mark had strained an adductor muscle and could barely lift his leg over the bike. Mary lost a bunch of training because of a back and shoulder strain. Another TeamUSA had lost a ton of training to caring for an ailing wife. As all-consuming and important as racing and training are in our lives, life tosses in challenges for all of us. So I had a choice– I could either try to make up for two months of lost training and just run myself into the ground or I could accept my situation, lose a few minutes, but really enjoy the moment. A younger version of me would have chosen the first option. This year, I decided to take the second option and have a fun race. The run course comprised two loops along the River Torrens in Elder Park in Adelaide. The footpath that we ran along was alternating paved and a few stretches of gravel. I couldn’t have asked for a better course. I stopped looking down at my Garmin– good thing because the pace that kept showing up on my watch was much slower than my actual pace. While I was taking the run easy, I wasn’t entirely non-competitive. There were a few people that I pegged early on as people to beat and I made sure that I did that. One guy from Canada looked like a good target and I made sure that he wouldn’t beat me. Unlike a lot of triathlon teams, my team (CycleU in Seattle) didn’t start as a bunch of runners who wanted to become triathletes. Instead, our foundation is cycling. So in big races like this, we always make up a bunch of ground on the bike. Unfortunately, this wasn’t the perfect course to do that on– it comprised four loops with at least 12 sharp turns per lap (including 2 U-turns). Having the extra bike handling skills that comes from lots of cycling does give us an advantage, but the all-out power doesn’t come through in such a technical course. Also, having hundreds of other cyclists to navigate around really tempers the amount of power that can be applied to the pedals. Heading out on the bike, everything went great. After a quick transition, I settled into my low tuck and got into a comfortable rhythm. One of the uncomfortable challenges of riding in Australia was getting used to racing on the left side of the road. I never really felt comfortable with it– especially when cars or cyclists would pass me on the right side. But I found that a race is an entirely different animal– I never even noticed the difference from racing in the United States. As I was cycling, I kept looking for my teammates and friends. In other races, this can be hard, but at Worlds it’s always easy. Why? Because at Worlds, our uniforms have our last names printed in huge letters on the backside of our shorts! And, with four laps and plenty of turns, the course was tiny enough that my friends and teammates are either going to pass me or I’m going to pass them. So while I was out there, I saw my friend Mark and Mary– and a bunch of other friends both from Team USA and Team Australia. Of course, we cheered each other on. This really meant a lot– I don’t get much of a lift when spectators cheer me on, but I get a huge lift when a fellow competitor supports me in a race. It’s a strange instant camaraderie of pain. While turns slow me down, at least I knew that they slowed everyone else down a lot more. That’s because Coach Colin on my team drilled us on how to negotiate high-speed turns and it was something that I practiced over and over. The reason most people have to slow down so much on turns is because they enter them too quickly. While it makes sense intuitively to ride the shortest line entering a turn, that means that overshooting the exit of the turn and either braking suddenly or crashing. Instead, taking a “mid apex” or even a “late apex” turn means that a cyclist can enter a sharp turn at full speed without braking. Only one of the turns necessitated a late apex and even a little braking– a sharp turn onto a much narrower street after a high-speed downhill– but otherwise all of the turns could be handled without touching the brakes. Nevertheless, I wasn’t gutsy enough to keep pedaling hard through all of the turns. Plus, I was only able to keep my tuck for about 2/3 of the turns. All in all, there were a ton of wasted watts compared to a more stretched out course. Overall, my time for the 40 kilometers was over twelve full minutes slower than my personal best– and it almost eight minutes slower than a last-minute 40K race that I did only a month earlier. But, given the nature of the course, it was one of the faster rides in my age group and moved me at least 12 places up in my standing– but that wouldn’t last long. In a great race, I’ll ride my bike really fast and then finish with a faster final run. This wouldn’t be one of those races. I’ve certainly had harder and more miserable second runs– particularly after really hilly bike courses before I learned how to temper my watts– but, on a physical level, this probably the worst feeling run in recent memory. Nevertheless, I had a blast. Off the bike, I noticed immediately that I would be feeling awful. If my lack of running over the last several months had hurt my first run, it utterly destroyed my second run. But it also put in the same dilemma that I had during the first run– should I kill myself for a marginally better time or just relax a bit and try to enjoy the race? Again, I chose the second option. Sure there were plenty of people passing me– I must have given up at least a dozen spots in my age group– but I think it was worth it. I wasn’t sandbagging it– just running hard and within my limits. It’s just that “running hard” would feel like running through quicksand– almost as if time were slowing down. Rounding one of the final turn, Tim Yount (our Team Manager for the race but also USAT’s full-time Chief Operating Officer) handed me a USA flag. I smiled and rallied. A short time later, my friend Jane took my best running race photo ever. Not only did I not look like I was having a stroke, but I actually looked like I was having fun. Plus, I had good knee lift and a nice posterior pelvic tilt (unlike the person I’m about to pass). And, nice squared off hips and hip extension. And, carrying an American flag. What could be better than that?